(Bloomberg) -- Iron ore jumped to the highest in almost two years on Wednesday as the world’s biggest miner said it would close some of its operations following last week’s fatal dam disaster in Brazil, which has killed at least 84 people and left hundreds missing. While Vale SA said it will make up for lost output by increasing production from other mines, the potential disruption to about 2.5 percent of world supply shook markets, from the share prices of rival miners to the Aussie dollar. One of the world’s bellwether commodities, iron ore is the primary ingredient of steel, the ubiquitous alloy used in everything from skyscrapers to razor blades. Australia and Brazil produce almost all of it and China buys more than anyone else. Supply disruptions can have far-reaching consequences. Iron ore reacted sharply. Benchmark futures in Singapore jumped almost 10 percent before paring gains back to about 4 percent, still at the highest level since March 2017. They went limit up on the Dalian Commodity Exchange. The focus for the market is now on how fast and effectively Vale will be able to replace lost production. It expected to mine 400 million tons this year and had previously said it has an additional 50 million tons of capacity, which could offset the 40 million it’s going to cut. But it will be contending with social and political pressures as well as ongoing investigations and that could complicate the process, according to Commonwealth Bank of Australia. Goldman Sachs Group Inc. has hiked its iron ore price targets for the next 12 months, forecasting that Vale’s production could be reduced by 10 to 15 million tons in 2019 as the company taps flexibility elsewhere to offset the rest of the losses. Furthermore, Vale has about 30 million tons of stockpiles in China, and running those down could also alleviate near-term stress on the market, the bank said. Any disruption to Vale’s supply may mean more business for its rivals. Rio Tinto Group, the No. 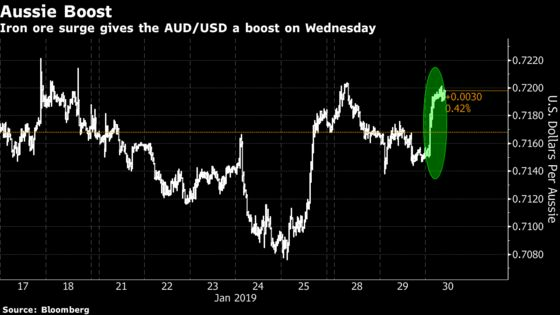 2 iron ore producer, soared to the highest in more than a decade in Sydney on Wednesday, before paring some of the gains. BHP Group and Fortescue Metals Group Ltd. also jumped. Vale may be the world’s biggest iron ore miner, but Australia produces more than any other country by far. Iron ore is of one the country’s biggest exports and the Aussie dollar often takes its cue from how the commodity is performing. The currency added 0.6 percent against the U.S. dollar. The stronger currency will boost the contribution of exports to the nation’s bottom line while also generating more revenue from selling iron ore at a higher price. 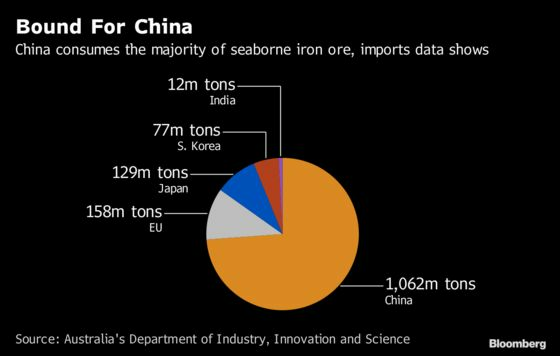 China consumes most of the world’s iron ore to feed its massive steel industry. In terms of total imports, even a loss of 40 million tons wouldn’t be decisive given it buys more than 1 billion tons a year, according to Li Xinchuang, the vice chairman of the China Iron & Steel Association. Steel producers, who will have to pay more for iron ore, shrugged off the news. Shares in China’s Hesteel Co. advanced in Shenzhen, while Baoshan Iron & Steel Co. was little changed. Part of the reason for the sanguine reaction could be rising steel prices, which may temper the impact of higher input costs, and growing optimism over U.S.-China trade talks. 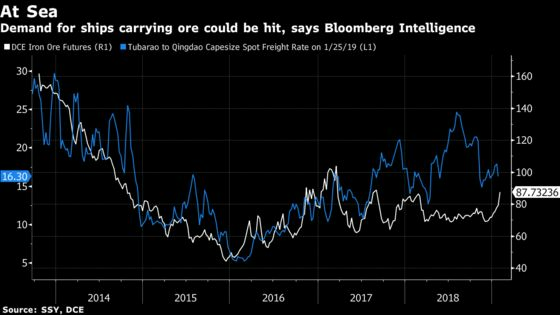 Lower shipments from Vale would be a “severe blow” to operators of the giant ore carriers that ship cargoes to China, according to Bloomberg Intelligence senior analyst Rahul Kapoor. Vale’s products need to travel about 8,000 miles (13,000 kilometers) farther than Australian competitors Rio and BHP to reach they key market. “It is a severe blow to Capesize vessels. 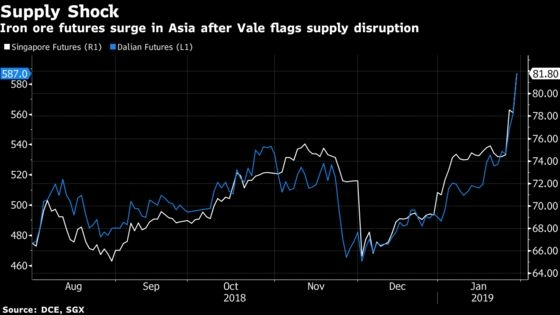 Already reeling from weak seasonality and a Chinese slowdown, loss of significant iron ore volumes from Vale will exacerbate the vessel oversupply,” Kapoor said. 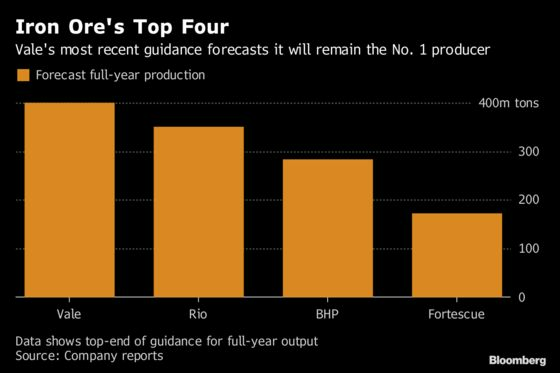 Last year was a “strong” one amid record output by Vale and the longer distances for Brazilian ore, and disruptions would likely add to pressure on freight rates, he said. Vale said that its closures include supply used to produce 11 million tons of pellets, small balls of iron ore that are fed into blast furnaces. That represents a big chunk of the 130-million-ton a year seaborne pellet market, according to CRU Group senior analyst Andrew Gadd. That’ll be a blow to steelmakers in Japan, South Korea, Taiwan and Europe, who rely on Vale’s supply. Vale’s incident is “clearly one of the most significant supply disruptions in recent history in the iron ore market,” Gadd said. It remains unclear if the producer can expand production any faster at its massive new S11D mine, where output is already being increased “at a rapid rate,” under a drive to improve margins, he said.